By Sabrina Tavernise with contributions by Mona Mahmoud, Sahar Nageeb and Qais Mizher. In the latest indication of the crushing hardships weighing on the lives of Iraqis, increasing portions of the middle class seem to be doing everything they can to leave the country. In the last 10 months, the state has issued new passports to 1.85 million Iraqis, 7 percent of the population and a quarter of the country’s estimated middle class. …Iraqi officials and international organizations put the number of Iraqis in Jordan at close to a million. Syrian cities also have growing Iraqi populations. 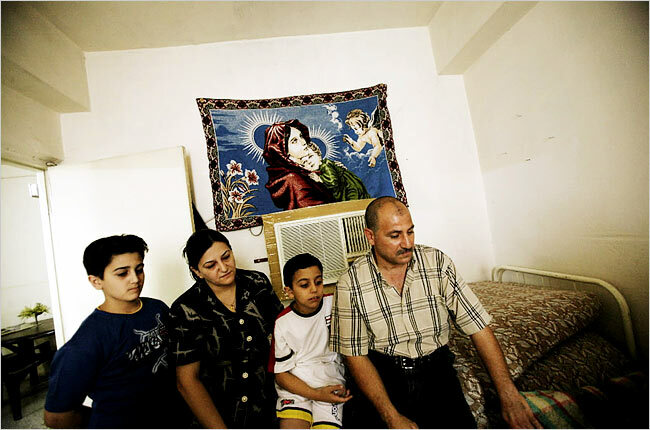 This Christian Iraqi family is not likely to head east to Iran, unless they like badges. The New York Times says that Assad Bahjat, with his wife, Eileen, and their two children, Elvis, left, and Andres are getting the hell out. Of course, the truth is that even at the start of the war when there were expectations of tens of thousands of refugees fleeing the violence of war, there was no more than a trickle, and many of those were going in the opposite direction. Jordanian Interior Ministry General Secretary Mukhaimer Abu Jamous told TNS that the accepted number of Iraqis in Jordan is more like 300,000 – though he was quick to claim that these are not refugees, but rather people on personal business or vacation. An official at the United Nations High Commission for Refugees (UNHCR) in Amman said that 15,000 Iraqis had received temporary protection for asylum-seekers pending official refugee status. Only 800 Iraqis have received official refugee status in Jordan, she added, almost all of whom fled during the Saddam Hussein regime. The official refused to allow TNS to report her name, claiming it is UNHCR policy for spokespeople not to be identified in news stories. When things have been truly desperate in Iraqin 1959, 1969, 1971, 1973, 1980, 1988, and 1990long queues of Iraqis have formed at the Turkish and Iranian frontiers, hoping to escape. In 1973, for example, when Saddam Hussein decided to expel all those whose ancestors had not been Ottoman citizens before Iraqs creation as a state, some 1.2 million Iraqis left their homes in the space of just six weeks. This was not the temporary exile of a small group of middle-class professionals and intellectuals, which is a common enough phenomenon in most Arab countries. Rather, it was a departure en masse, affecting people both in small villages and in big cities, and it was a scene regularly repeated under Saddam Hussein. Since the toppling of Saddam in 2003, this is one highly damaging image we have not seen on our television setsand we can be sure that we would be seeing it if it were there to be shown. To the contrary, Iraqis, far from fleeing, have been returning home. By the end of 2005, in the most conservative estimate, the number of returnees topped the 1.2-million mark. Many of the camps set up for fleeing Iraqis in Turkey, Iran, and Saudi Arabia since 1959 have now closed down. The oldest such center, at Ashrafiayh in southwest Iran, was formally shut when its last Iraqi guests returned home in 2004. As Prairie Pundit had pointed out last month, the Multi-National Forces-Iraq tracks refugee numbers and has very low estimate based on their findings. 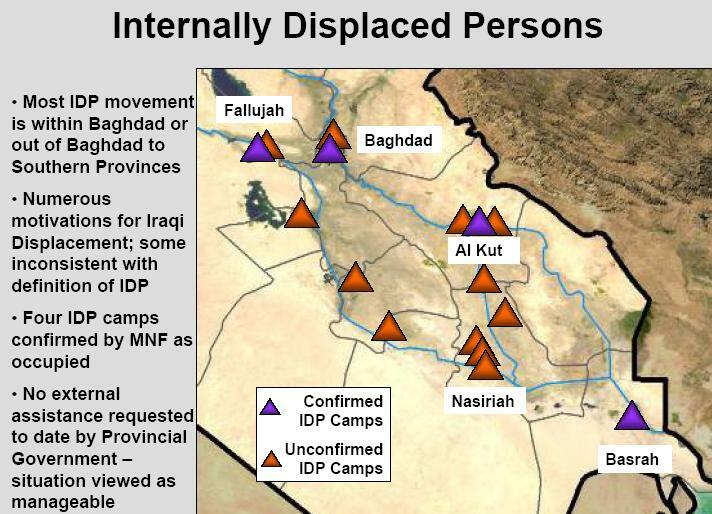 This is the official map of IDP camps in Iraq. Another indicator for civil war would be forced population movements. And we are extremely sensitive to that. We see reports of tens of thousands of families displaced here in Iraq, and we chase down each and every one of those reports. And I’ll show you detail in a minute. But we have seen some displacement, pockets of families moving, but not in large numbers…. …And this is very important. We have not been asked for any assistance for displaced civilians. The provincial government has not asked, the local governments have not asked, the national government has not asked. So if there are indeed 36,000-plus families that have been displaced, we’re not seeing it. We indeed move to check every report of displaced civilians. 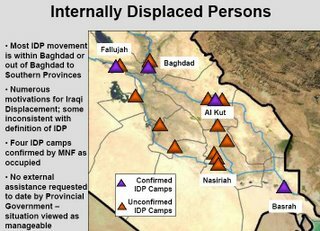 And we were told about displaced civilian camps, and of the 16 that we were told about, we can only confirm the location of four — one in Fallujah, one in Baghdad, one in al Kut, and one down in Basra. This is just like last month when the New York Times pretended there were 100,000 families wandering around the Iraqi desert. However, there is no mass exodus. There are no swelling IDP camps! But, the four contributors at the New York Times would rather stick to story-telling. Dr. Sanity tries to make sense of the Times reporting.